I have a soft spot for genies which is why I'm featuring this new cross-genre novella from M.C. 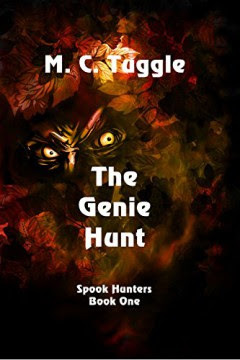 Tuggle: The Genie Hunt. Buddy Vuncannon, an attorney in High Point, North Carolina, and his friend Coot Pickard are heading out of town for a fishing weekend when they're surrounded by a SWAT team. Three eyewitnesses have identified Coot as the gun man in the latest of a string of robberies. To defend Coot, Buddy must stand up to a bullying district attorney, uncover the identity of the real robbers, and battle a powerful genie who serves the robbers. Buddy's investigation implicates an old friend, reigniting long-forgotten friction between Buddy and Coot. Old and new loyalties clash, leading Buddy and Coot to a desperate chase that forces them to seek the help of a madman they both fear. Check out M. C. Tuggle's other fantasy and science fiction at his Amazon Author Page. The Genie Hunt is free for Kindle Unlimited subscribers. If you want to see if subscribing is right for you, can get a Kindle Unlimited 30-Day Free Trial.